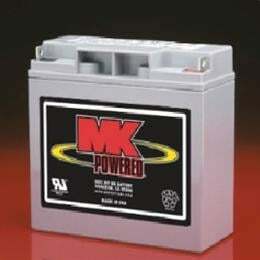 12 Volt, 18 amp hour battery Deep Cycle: Premium sealed batteries capable of up to 1000 cycles (50% DOD) as fully tested by independent laboratories. Gelled/Suspended Electrolyte: No liquid of any kind; battery is completely sealed. Safe in any position (except upside down). Maintenance Free: Water is never added; low liability Travel Ship Easily: MK batteries are F.A.A, IATA, and UPS approved. Others may not be. Safety: Sealed batteries have a special re-sealing vent system that prevents excessive internal pressure; thus they cannot explode under normal conditions.